This is my first and last reminder for my auctions! Including a custom Mienshao pokedoll! 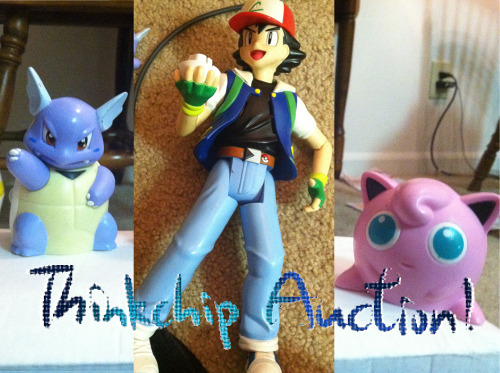 It's still at its starting bid along with awesome Raichu, Luxray, Absol, Lugia items plus many more! I also have very rare R/S/E play-doh molds with no bids. Please get your final bids in as my auction will be ending on April 10th @ 6:00pm PDT time. Any bids would be appreciated! Happy collecting! My G/S/C 3 set has finally arrived:)so my collection was increased alot. I still have 5 slots open for Poképin commissions this month. 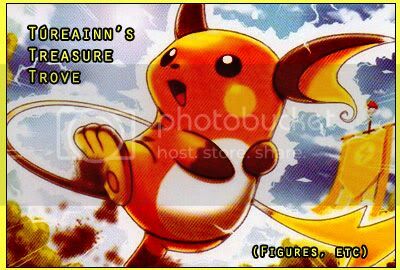 The Thinkchip Pokemons are still at their starting prices at low as $1/$2, so you may want to grab this chance to get a Thinkchip Pokemon for cheap! I just ordered a Maggyo hat from a new eBay member with no prior selling feedback, and they added so many gifts!! The charm is Victini ^_^ I'm not worthy ;____; Every item came wrapped in a different Pokemon Center bag! Just a reminder that my plush auctions will be ending tomorrow tuesday at 10pm EST. All items are in starting price, so if you would like to bid, please click here !! Please cick here for sales. Thanks!! 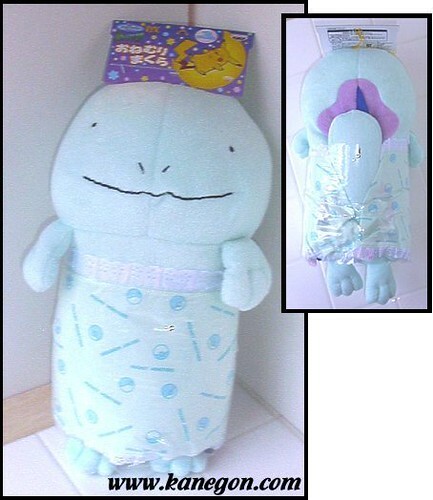 There are a few small items i'm looking for, for right now I will post the kids and a plush want! There's definitely a lot more that I want, but these are just the ones I want most right now, so if you have a large assortment of kids, direct me to them and I will check those out too! 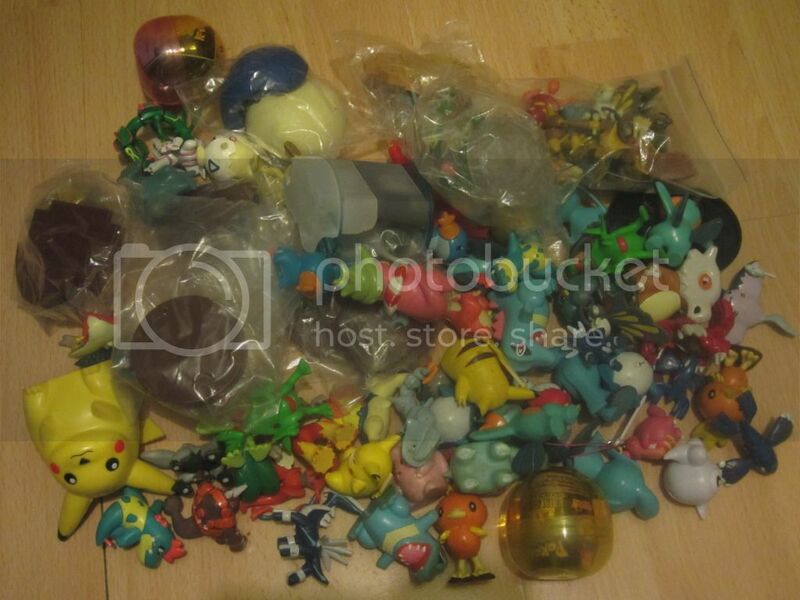 First of all, I'm going to have to be lame and let you know I don't have any photos to share as my camera has no batteries, but my favourite Pokemon I own is my Banpresto Chikorita, which I'm sure most if not all of you know of. I like figurines too but the main thing I collect is soft toys. If anyone wants to read more or see what I'm looking for, go ahead! 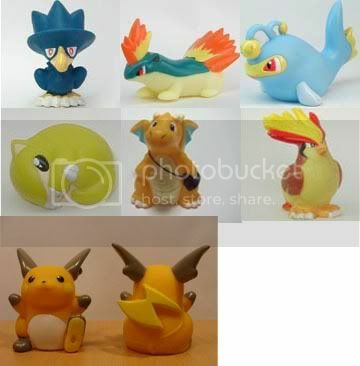 Does anyone else have a preference when it comes to collecting Pokedolls (or other items, really) that originate from Japan instead of the other releases? Or vice versa, really. I'm currently on a mission to collect a Pokedoll version of every major game Mascot to display, like Lugia for Silver, Rayquaza for Emerald, that kind of thing. 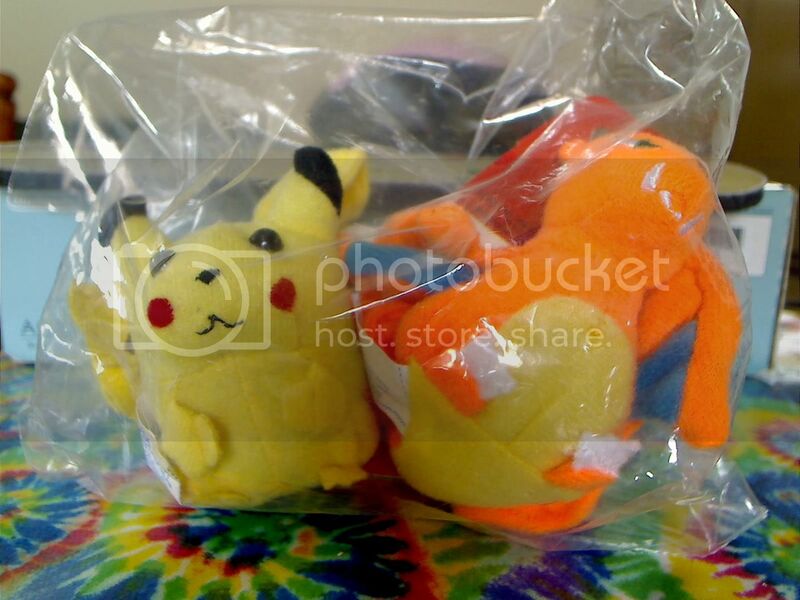 And I find that I have a tendency to try and find versions with the traditional Pokedoll, or newer Japanese blue tags. I know they're more expensive, but everything's gatta match! Anyone else have a similar preference? Is there really any type of difference other than the tags? I've only ever owned Jpn ones so I can't compare. And a little sales plug as well. HUGE Card lot sales,Lugia Hat Offers, and Auctions! So today my boyfriend decided to bring over THREE binders full of cards for me to look at and possibly sell to you guys(otherwise they will be going into a garage sale or back into the depths of his closet) I found a few gems in there! (I think...) But the rest are up for grabs in one big lot! Up for auction today are a First edition holo Blastoise and a First edition holo Clefairy I also have a few other first editions up for sale as well! Hey everyone, I have two lots and an auction for you today~! Hey guys, its that time again.. Time for AFRO's UPDATES!! woo! anywho, here are my gets! Sorry i didnt have enough time to make a it fun or interesting, maybe next time? I need some money for a trip I'll be taking soon, so I'm putting some stuff up for sale. ~Three sets of sales~ COLLECTION UPDATE?!?! 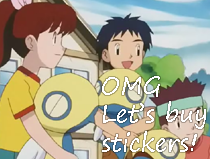 Stickers, TCG, and others! Woah! Click on pics to get there. Everything has updated. 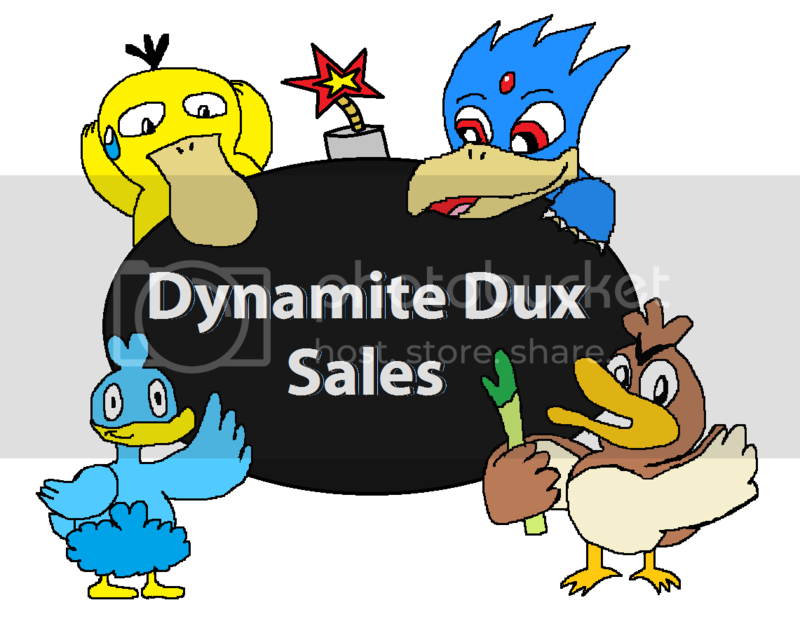 Sticker prices lowered, cards added, and a Shiny Entei zukan and some neat disc thingies are the stars of the normal sales update. I DID SAY COLLECTION UPDATE, DIDN'T I?! I can tell you one thing, you're not expecting it. "But Ryth, I thought you had them all!" Well, I do! Figure-wise. Flats-wise I will be looking forever for 'em all. WANTS POST! ~ WANTS POST! ~ Sell Me An Eevee Walky Umbrella? + Other Walky Items Wanted.. 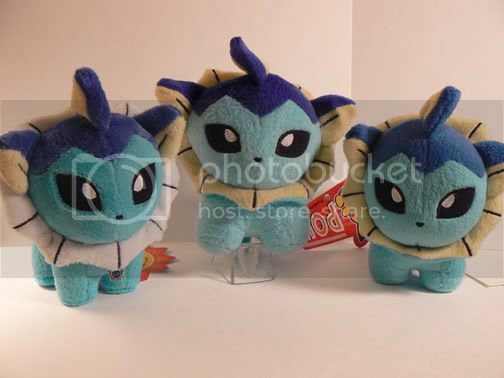 I've noticed that Vaporeon is a very sought-after plush, and that even the pokedolls can cost around 80-100 dollars in some cases. However, I was wondering if it was only specific ones. As shown in this picture (Thank you, Keymonster, for letting me use this! ), there are three different kinds. To my understanding, there is the minky one, the Velboa re-release from 2007, and the original velboa from 2004. My question would be, between the minky and the 2007 velboa, is one usually more expensive than the other? If you participated in the r/s/e 3 GA - good news, we've won! Deputy fees smashed any discounts we would have had, but these Zukan are still at pretty good prices compared to what they usually go for! all payments are listed in USD and should be sent to redjen(at)hvc.rr.com with @ where (at) is. Reminders will be sent out later today. Let me know if you have any questions, and post here once you've paid! I'm also selling a MIP r/s/e 7 Deoxys Zukan for $6 + fees, if anyone's interested! If you buy it tonight I can ship it out tomorrow. Sold, thanks! I come with you with some commissions i'm opening up! But, first, does anyone have any Chou Get Bases with ONLY the Pegs and the base? I'm looking for some so I can make some Commissions! Now, on to the good part! This is the last reminder for my sales. I've gotta get things sold, packed and shipped out by Wednesday, so I've lowered the price of almost everything remaining! Hi! 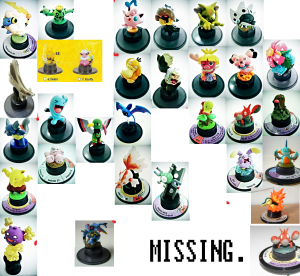 :D There's two spots left (Boy+Eevee and Hideyoshi+Infernape) - if anyone is interested please click the picture to go to the group buy. I'll most likely be also ordering these two sets for sure (unless somehow the other set gets filled up really fast), but if you would like to get them at a lower price as a participant this is the chance. NEW GETS, HELP ME NAME MY POKEMON. LOOKING FOR CARDS AND SALES! what pokemon came in this package!? Tepig comes in near mint condition with his tush tag in perfect shape! He has no hang tag. He does come from a pet-friendly home, but the animals aren't allowed near the plush! There may just be a stray hair or two. 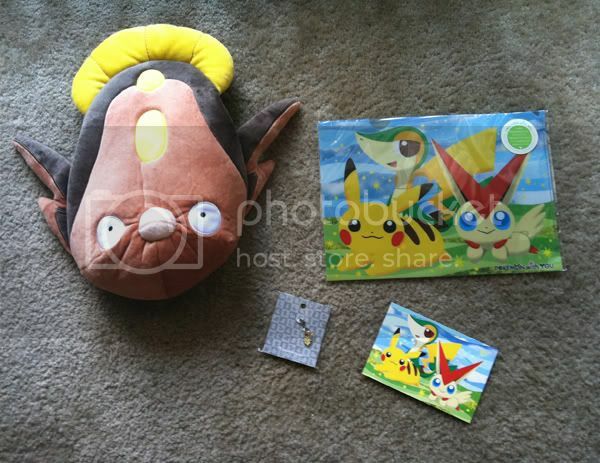 I'd like to get $150 shipped in the US (international will be more) for Tepig. If you need any more info or I'd like additional photos, please ask! I ship from the US and was granted sales permission by lineaalba in February of 2009. A Get! A Want! And an Update! I got a really cool little set of charms in the mail today that I just LOVE! They are so tiny and so unique!! I'm not even a fan of raffy or monkyeface but LOOK! lol I'm going to have a hard time deciding weather or not to keep them! its just such a cute little set that I feel i should keep them together! I also narrowed my wants list to just ONE thing! ONE! I pay u pretty pennies for dis one! FIRST! Still missing 3 payments! Almost there: paperoid, peeche00, gothybeans, and starletchu. Sales... My oh my, have I almost messed up! Reason why behind the cut! First of I was wondering if there were any Scrafty merchandise. I know there is a zukan of it but is there anything else? And if there are is anyone on the comm here selling any Scratfy merch (preferably not flats) because I'm planning on getting it/them for my little sister since her birthday is coming up soon. I'm looking for Clearfiles for myself preferably ones that can fit 8x11 paper. On a good note today I got this in the mail. Woohoo. Its bigger than my laptop!! Kyedhen needs to get any junk she doesn't want out of her room before June. I'm leaving for Japan in two months and I don't want this stuff lying around my room any more. I don't want to pack it away with my collection either, so please take it away from me! Featuring massive reductions! Everything must go!